If there is one type of dish that I do over and over again, it has to be goi. Anytime I visit my parents I always prepare a fresh plate of goi for dinner. Goi is extremely easy to prepare and healthy for you. Once you get the hang of making it you pretty much try to turn everything into a goi, or at least that's the case for me. Happy cooking! 4. Wash and clean out the squids. 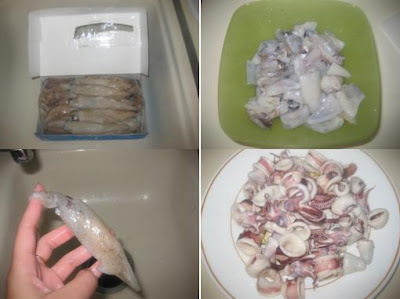 Cut squid into smaller pieces. Cook squid in boiling water for 5 minutes. 1 teaspoon of minced ginger Combine squid and marinade and toss together. Make sure you do it thoroughly or the squid will be bland. Drain any excess liquid from the onions and bell pepper mixture. Drain any excess liquid from the cellophane noodle. Toss together the squid, onions, bell pepper, and cellophane noodle. Add additional lime, fish sauce, and chili paste to your liking. Once you are satisfy with the taste, drain excess liquid. Add the rau ram and toss. I've been looking for good Vietnamese cooking blog and I'm happy to have found yours. Yummy! I am craving some of this. Can you make me some without the bell peppers? OMG! 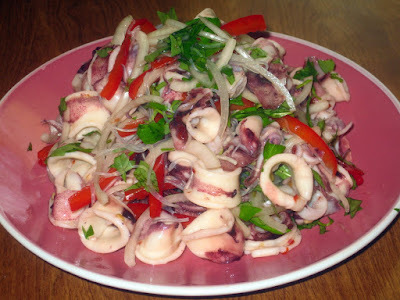 i love this squid salad. im going to try it out soon. amzing!! I love your blog.